If you’re on the lookout for short-term setups on the Kiwi, then I’ve got just what you need since I’m serving up a retracement setup on NZD/CAD and a channel on NZD/CHF in today’s intraday charts update. 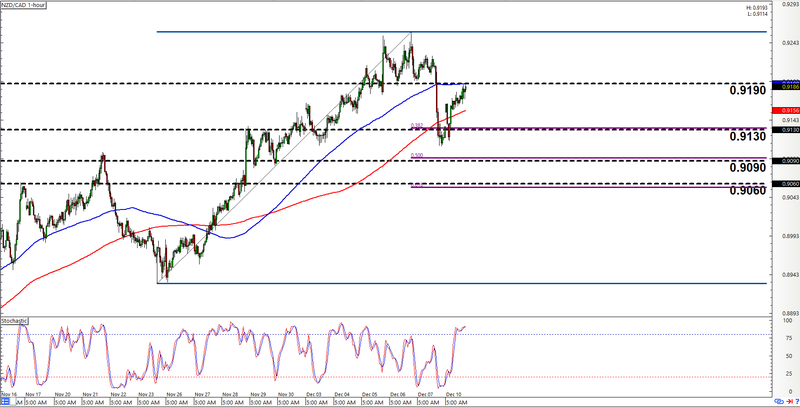 NZD/CHF has been trading ever lower recently. And if we connect the troughs and peaks, we can see that the pair has been trending lower while trapped inside a descending channel. 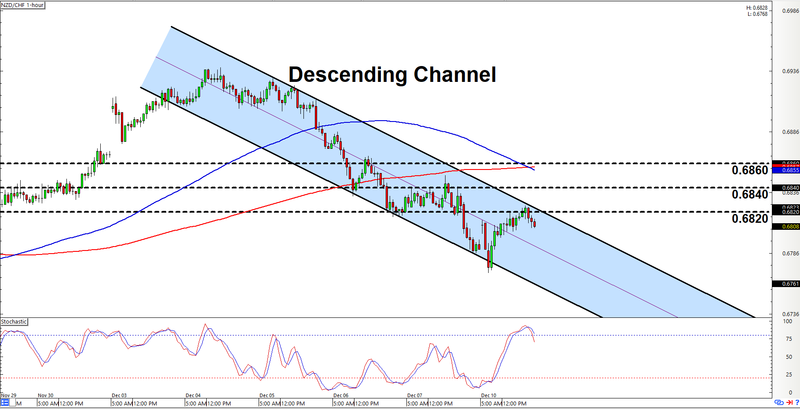 Presently, the pair appears to be gearing up for a downswing after testing the channel’s resistance at 0.6820. Stochastic’s also indicating overbought conditions and all that already. And since them moving averages just crossed-over into downtrend mode, y’all may therefore wanna start lookin’ for opportunities to go short on the pair. Do take note, however, that if y’all zoom out or move to the higher time frames such as the 4-hour chart, then you will see that bulls still have the upper hand. And that means that there’s a chance that the descending channel may fail. And in the event that bulls win out and the pair stages a topside channel breakout, then clearing 0.6840 and 0.6860 would validate the breakout move. Y’all may wanna think about bailing yo shorts or switching to a more bullish bias then. As y’all can see, NZD/CAD surged higher until it encountered resistance and began pulling back. The pair then found support at 0.9130 and now appears to be moving back up again. Y’all therefore better decide quick if it’s still worth it to jump in with a long. However, just take note that stochastic is already signaling overbought conditions. Also, the pair already appears to be hesitating at the area of interest at 0.9190. There’s therefore a chance that the pair may move back down again and allow y’all to get in at a better price. And if the pair does move back down, then all three Fibonacci retracement levels look like potential support areas since they all line up with or are close to areas of interest. However, if bearish momentum is so strong that 0.9060 fails to hold as support, then the setup is invalidated and y’all may wanna think about switching to a more bearish bias on the pair. In any case, y’all just make sure to remember to practice proper risk management as always, a’ight?